Use cockpit instrument blocks to display flight status information from your model. Use the blocks for flight instrument gauges to visualize navigation variables, such as altitude and heading. View signal data using any flight instrument blocks. Programmatically interact with flight instrument gauge band colors. 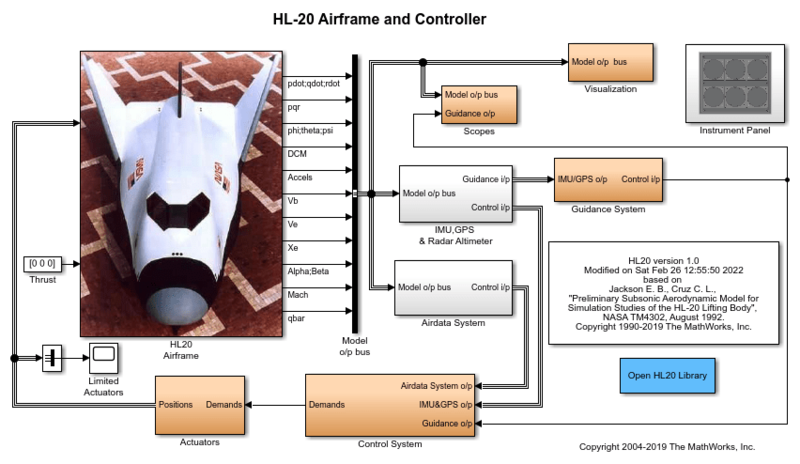 NASA's HL-20 lifting body and controller modeled in Simulink® and Aerospace Blockset™ software. This model simulates approach and landing flight phases using an auto-landing controller. The Visualization subsystem uses aircraft-specific gauges from the Aerospace Blockset™ Flight Instrumentation library. NASA's HL-20 lifting body and controller modeled in Simulink®, Aerospace Blockset™, and Simulink® 3D Animation™ software. This model simulates approach and landing flight phases using an auto-landing controller. The Visualization subsystem uses aircraft-specific gauges from the Aerospace Blockset™ Flight Instrumentation library.